Over the next 40 years, Australia’s ageing population is set to double. Since 1970, the proportion of people aged 65 years and over has increased to 13 per cent – a figure set to rise to 25 per cent by 2058. A key focus for Australian aged care services will be the promotion of independent living. Independent living eases pressure on Australia’s aged care system, with recent research showing that older people report higher levels of health and well-being when able to remain at home. A reported 23 per cent of consumers considering aged care design are now in the 45-54 age bracket. Research shows that many Australians are planning ahead, with the intention to stay at home longer. Property owners are increasingly refitting their bathrooms, and as part of the process are considering design options that cater for them as they age. At the same time, research has highlighted the bathroom as a high-risk environment for senior persons. Quality bathroom design is a crucial factor in enabling the elderly to maintain independence for longer. The government has made a concerted effort to address the design issues of the bathroom environment amongst architects and specifiers, introducing a number of changes and initiatives. Recognising the need for more relevant information for older Australians, the Australian Research Council has funded the "Liveable Bathrooms for Older People" Project, currently undertaken by Caroma in partnership with the University of New South Wales. The research aims to provide in-depth testing and analysis of how older Australians use bathrooms on a daily basis. This information will be used to form future design principles and identify key areas where crucial planning is required. This includes easier access and use of the toilet, shower, bath and basin as well as considering factors such as toilet height. 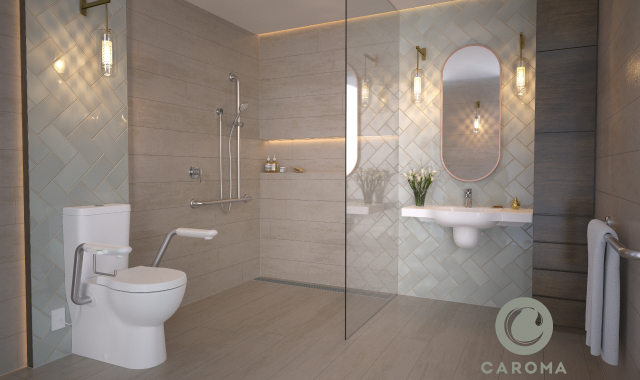 Today, Caroma offers a professional bathroom solution for independent living, with a full range of products to cover every aspect of bathroom functionality; from grab rails, raised toilets and rail showers to single-lever mixer taps and cistern-wide back rests, backed up by research from our inhouse R&D team. With the addition of this wealth of new information from the ‘Liveable Bathrooms for Older People’ Project, Caroma, Australia’s leading bathroom brand, is focused on leading the way in aged care bathroom design. By gaining clarity on the future design requirements for independent living, Caroma is helping Australians to stay independent for longer and in a safe, comfortable and stylish environment. The Urban Developer is proud to partner with Caroma to deliver this article to you. In doing so, we can continue to publish our free daily news, information, insights and opinion to you, our valued readers.